I'm working on some of my '1 year later' newbie long arm quilting posts. This is one of them - tools I use. I am a minimalist when it comes to supplies. I dislike clutter and lots of 'stuff'. So far, these are some of the tools that I find I use constantly, in addition to basics like thread, a few rulers, etc. Hope this helps anyone who is new to long arm quilting! 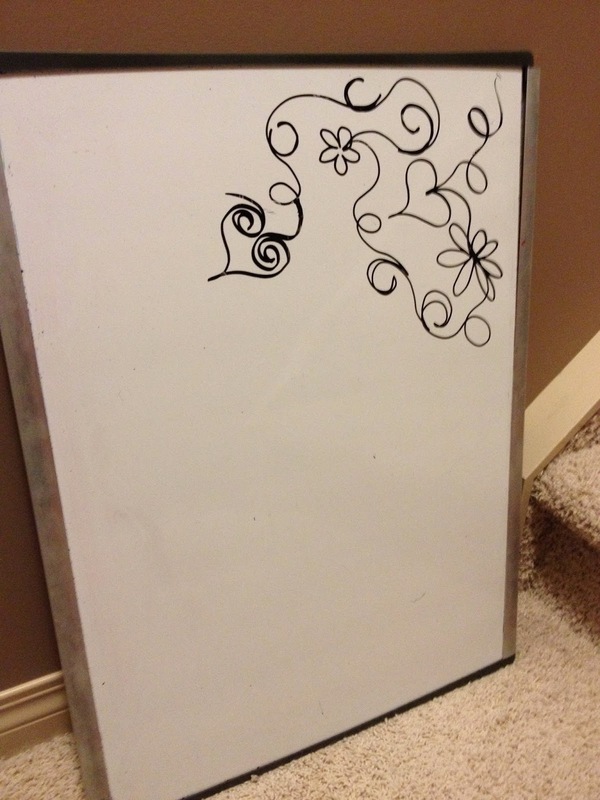 Whiteboard. This really helps me to practice some designs, doodle a sketch, or just get a path of a design - something that will fill up a space without gaps or without getting trapped in a corner. An enlarged tall table surface - I made this with a sheet of plywood, a few layers of batting and some cheap cotton I found at Ikea. I plunk it over top of my existing table top to make it a larger surface area and it is a perfect pressing surface and cutting table. It slides around somewhat if I lean on it, but it doesn't flip or slide off. It is heavy enough to not be a nuisance. As well, it is a larger space to spread out a quilt to trim threads, remove lint, etc. Saddle Stool - This is height and tilt adjustable and I use it when I need to do some really finicky dense work or I made a huge error and need to spend 2 hours picking out stitches at my frame. I love it, and recommend the bottom foot rest as well. 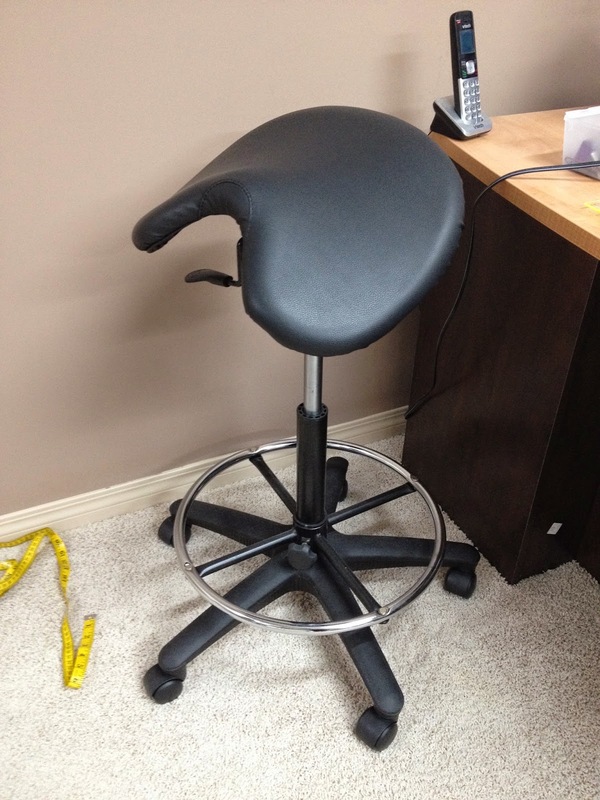 A saddle stool is not for everyone - it takes getting used to as it really is a saddle style. You have to hike your hip and thighs over the middle section so that takes getting used to. like a saddle! I find my posture is excellent using this stool. 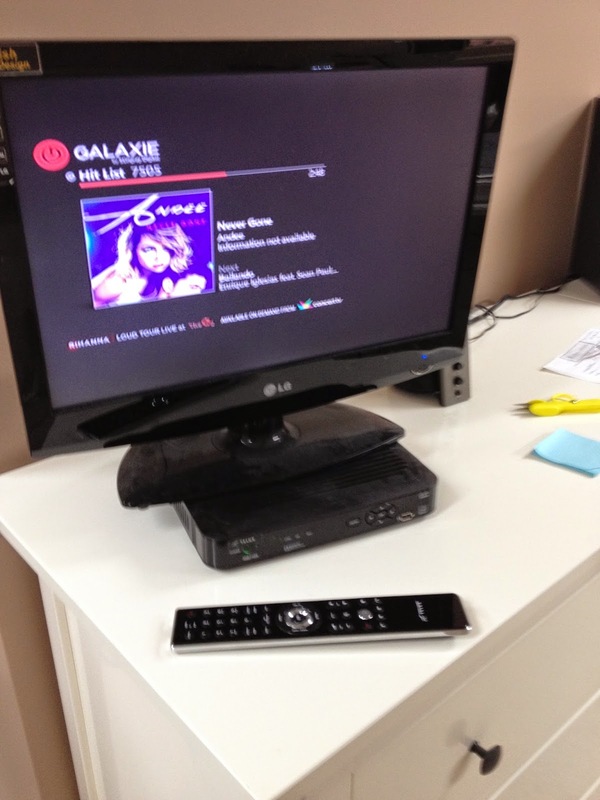 Television with good speakers. I watch/listen to tv and music. Keeps things a bit more exciting in my studio! Reading glasses. 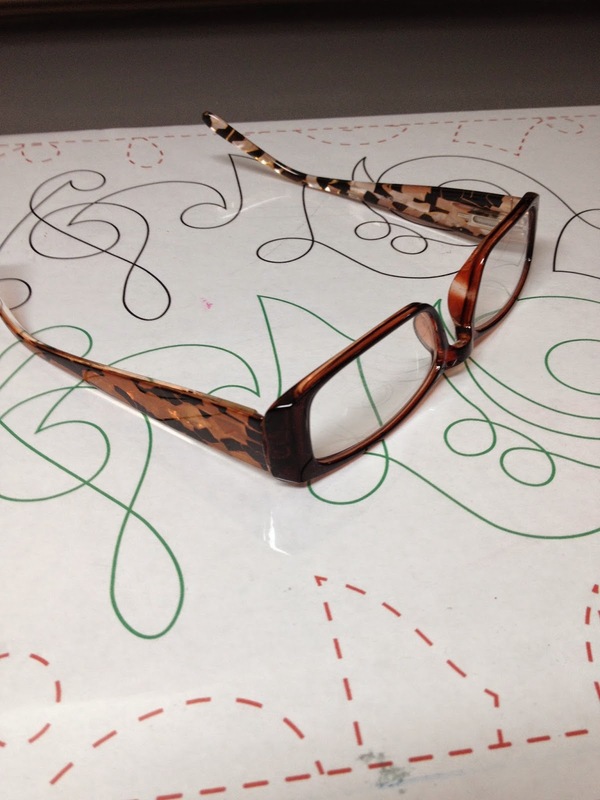 After a year of quilting, I realized that my eyestrain and drooping eyes were caused by the fact that I needed reading glasses - and in developing news - probably a special prescription JUST for long arm quilting. sigh. I know. It's the aging process. Take good care of your eyes, and if those cheap readers at costco relax your eyes a bit when you are doing close up work - use them. Don't be stubborn and in denial like me. Trust me. 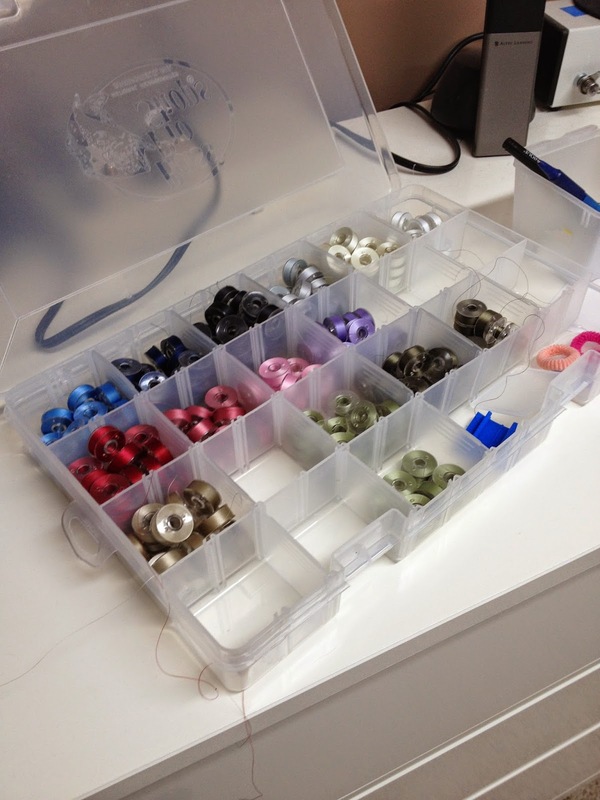 I had bobbins everywhere and finally figured out a good storage system for them. I bought a fishing tackle organizer from Outdoor World for $3.00. It keeps them perfectly organized. A magnetic pin tray - this is from an automotive store - it's for mechanics to hold car parts when they are working on vehicles. This is awesome - it sticks onto your frame magnetically and you can easily pin without worrying about the container flopping around. C- Clamps. I'm sure you could find similar things at the local hardware store. 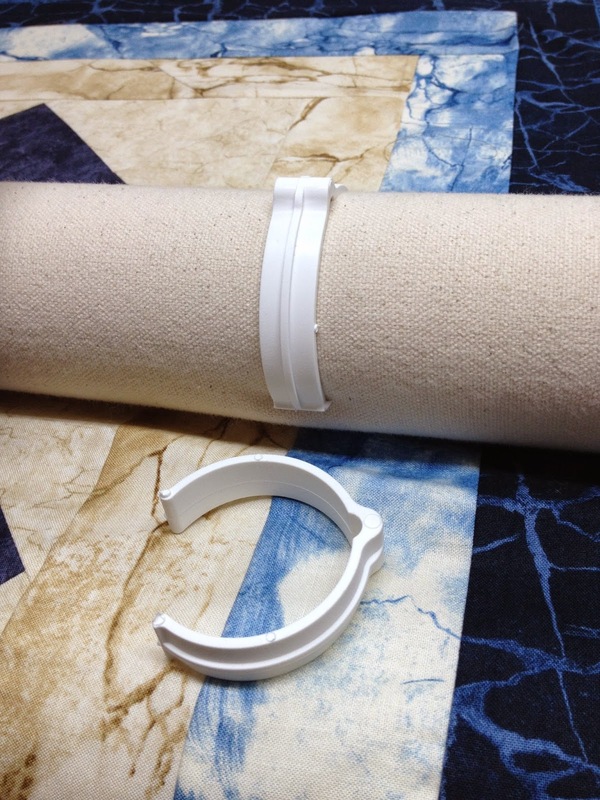 They are plastic C clamps which you clip onto your quilt rollers. 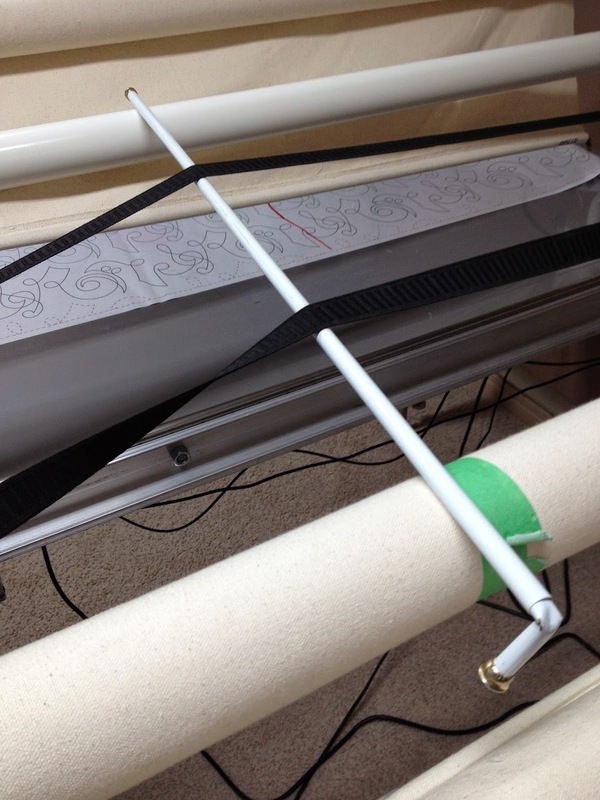 I use them to keep the edges of the quilt straight; line up seams on a quilt, etc so that as I advance the quilt, I can always line seams and edges up according to where the clamps are. 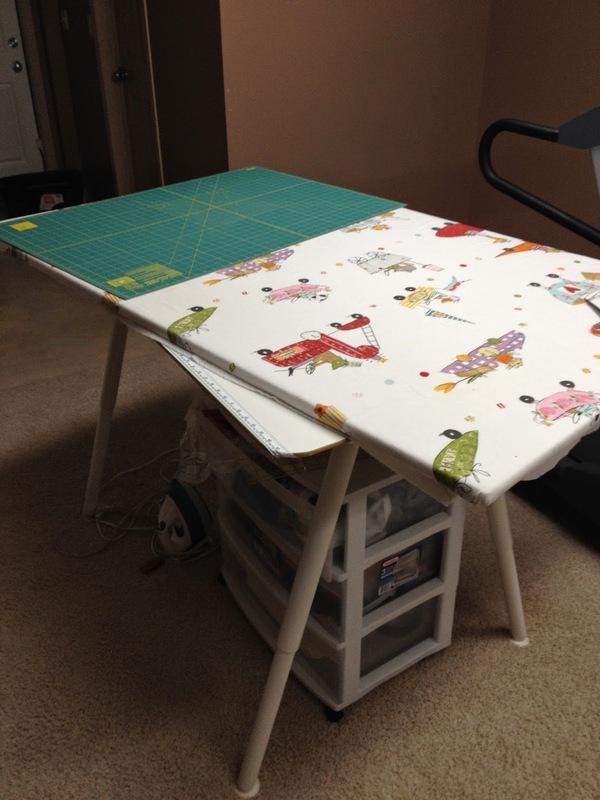 It really helps keep the quilt top straight. See how the clamp in the above photo is on the roller? It lines up with the seam between the taupe/blue fabric: - so as I advance my quilt top, I make sure it is always lining up with that seam. Of course, sometimes there is a variance if the piecing is way off! 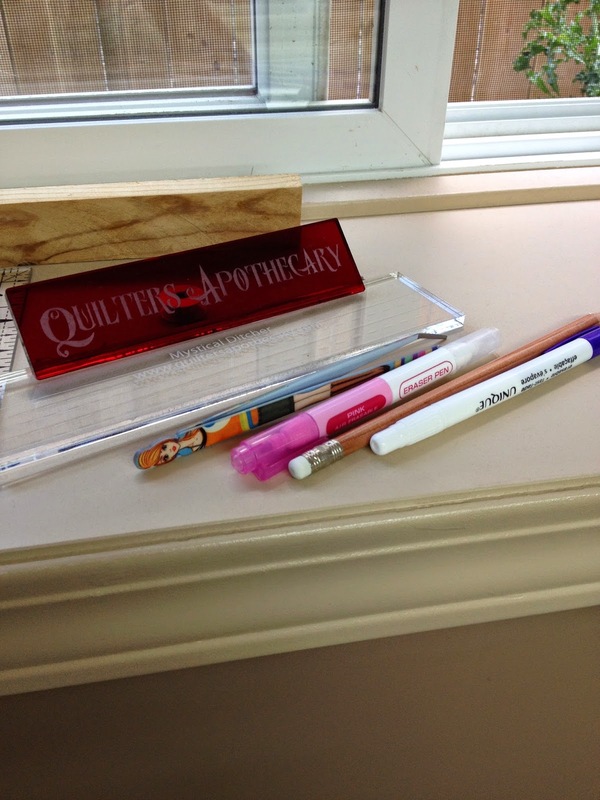 Basic tools - straight ruler - I use this one all of the time. It's more than awesome. Tweezers. Marking pens and pencils. Still on the hunt for the perfect marking pen. Snips - I bought these for about $25 or $30 and though I gulped at the price, they are well worth the investment. 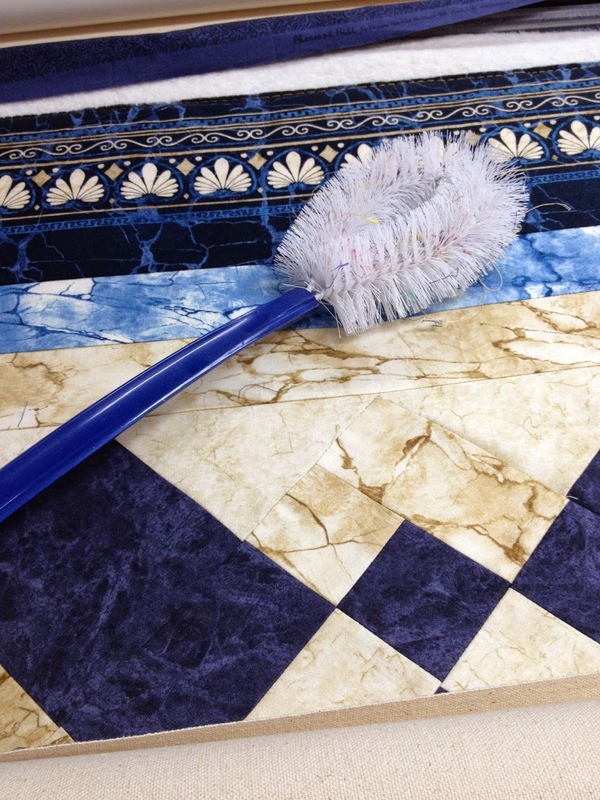 They trim very close to the quilt surface and are super easy to use. Love these! 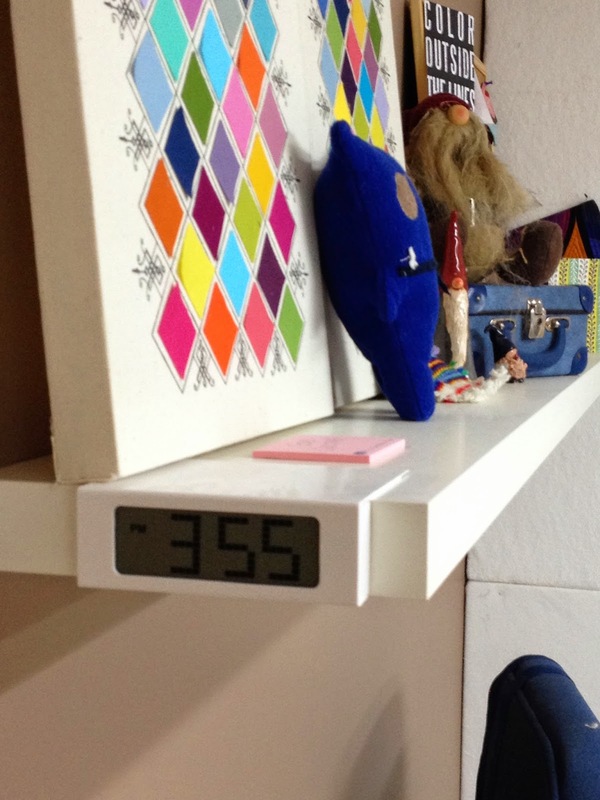 Clock - you can lose track of time in the studio! 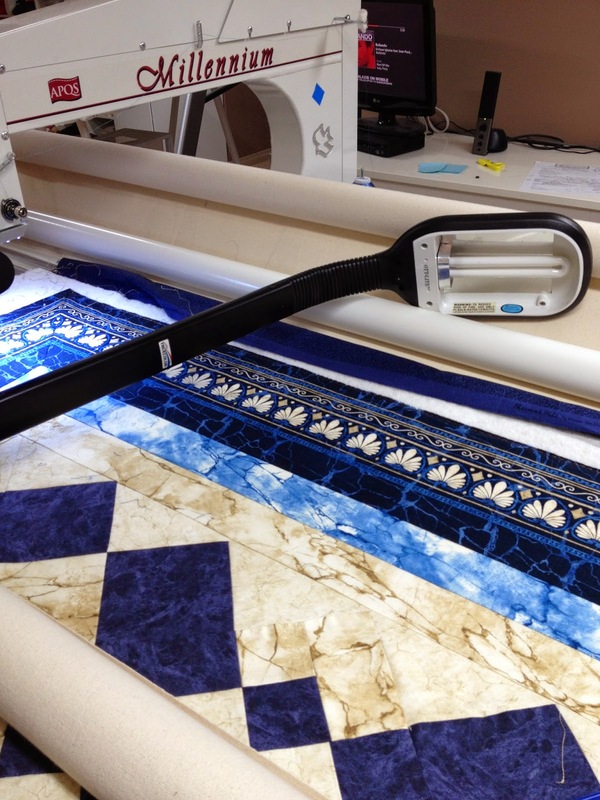 I use this side lamp for the majority of my quilting if I am working from the front of my machine. I quilt in the dark most of the time with this light shining along the surface of the quilt. I am going to be making this sidelight tutorial from Jamie Wallen as soon as I can find the time. 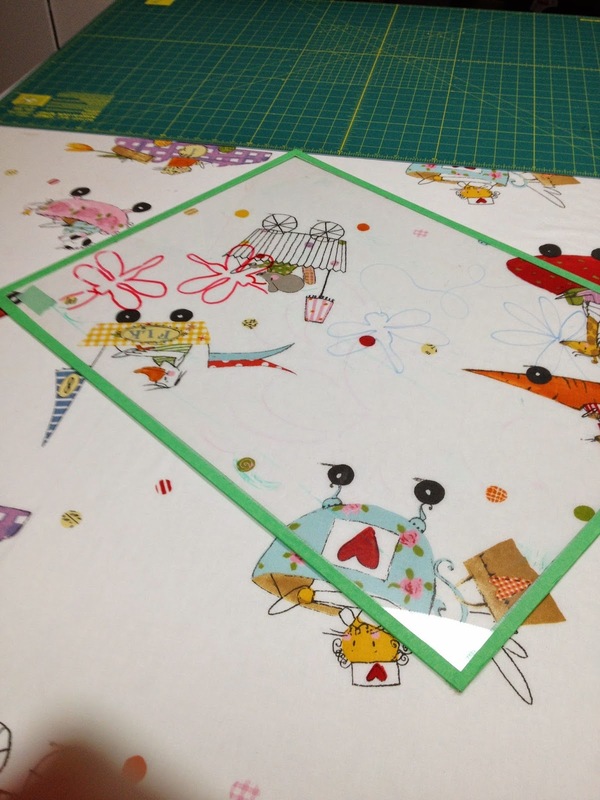 A piece of plexiglass is fabulous for auditioning designs on top of the quilt! Gum. 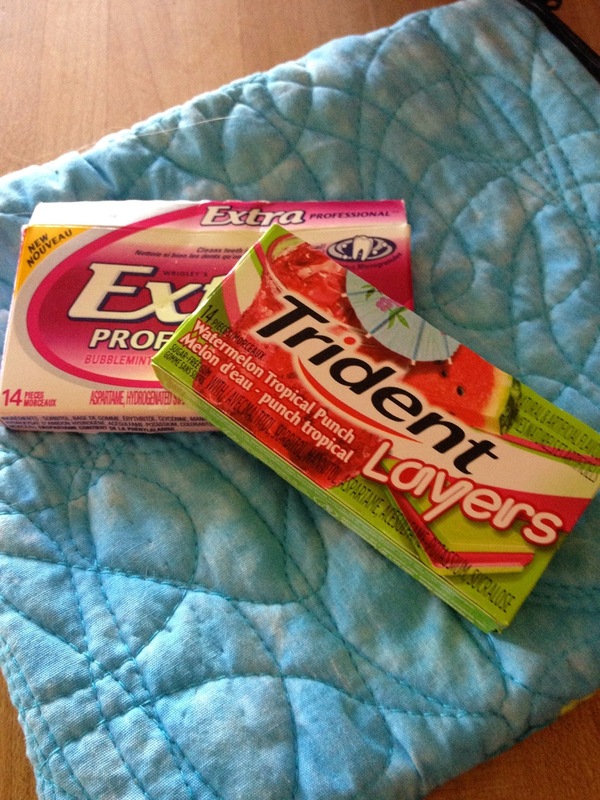 Candy is a no no for me, so gum really helps to keep me going. Garbage bins - everywhere. I have 4 in my studio. 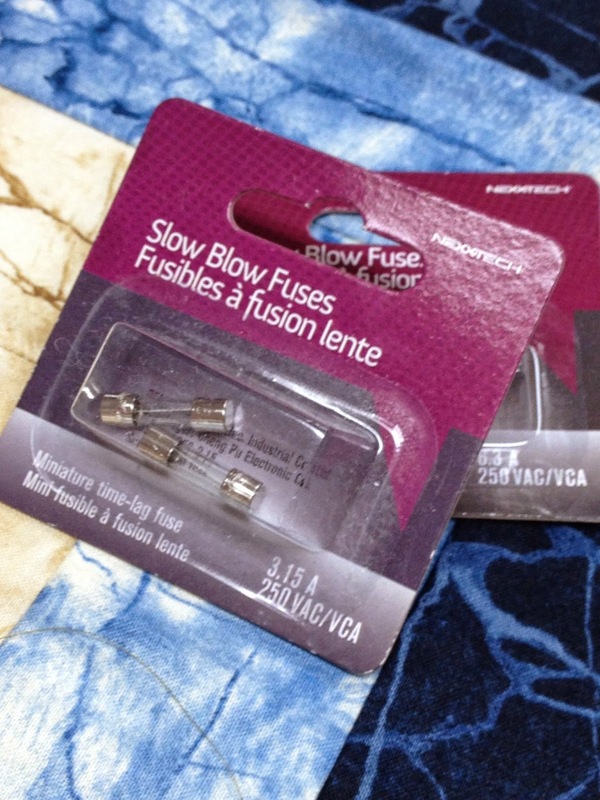 I haven't needed fuses in a long while, but these are very necessary in your first few months of long arm quilting. 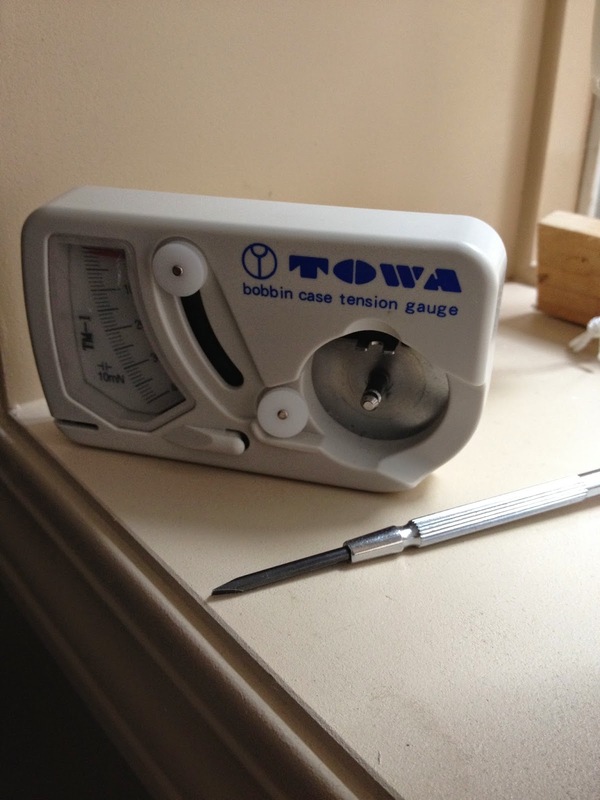 This tension gauge is probably unnecessary, but it really takes the headache out of figuring thread tension for me. 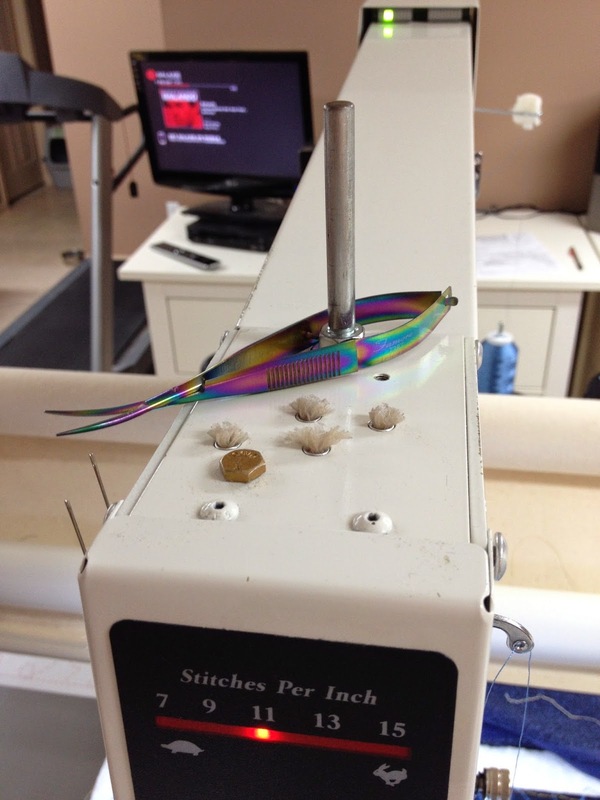 If I know my bobbin tension is set at my sweet spot, then I only have to worry about adjusting my top thread tension! See that little felt circle on the side of my machine? Best hack ever. I bought sticky felt furniture/floor protectors pads. Stuck one onto the side of my machine. Now I have a very convenient spot for my needles when I am burying threads! Great tips and tools. I have a red plastic cup velcroed to the top of my machine. I use it to put all my threads in so I don't have to throw them on the floor! 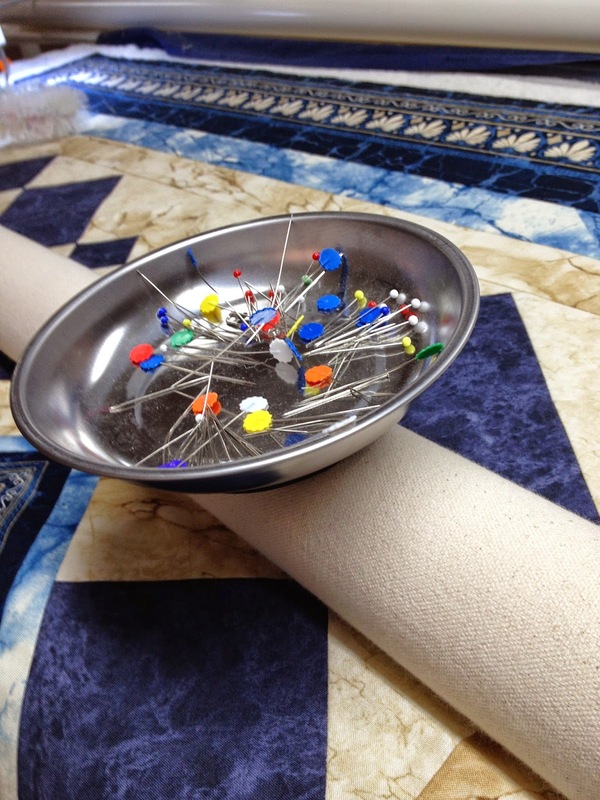 Love all your tips especially the one about the felt circle to keep track of the needles to bury your threads. Thanks for posting them. As I am a beginner, this post is very useful for me and I have bookmarked this. I always surf the internet for quilting and sewing information and bookmark useful links for reference. Yesterday I found a very useful link about quilting at http://www.warpandweft.ca/blog/ . To date I have arranged these tools for quilting and sewing as a beginner and am always finding more:-Rotary Cutter, Rotary Cutting Mat & Rotary Rulers, Sewing Machine, Cotton Quilting Fabrics, Big Ironing Board, Fabric Scissors and Paper Scissors, Cotton Thread, Quilt Design Wall, Pins & Needles. Hi Josh, Great you are delighted with this particular 357. I've got one myself since like 10 decades. I like it as well, not modded as yours nevertheless. Currently it does not operate, it chokes when warm. Brought into a neigbour of mine and he will get a deeper look at it. It feels just like a few have had difficulty using the automated decompression valve, so does yours have this?